By the illustrious Vavasour of Awatere, one of the protagonists of vigorously fruit driven Marlborough Sauvignon Blanc.It's not just the grinding westerly winds or the imposing presence of Tapuae-O-Uenuku. Deep, rocky soils and arid climesall make a contribution to the inimitable character, flavour and texture of Vavasour's wines. 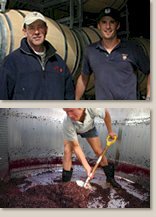 Fruit for Redwood Pass is harvested from Wairau and Awatere Valley vineyards throughout the cool of night to retain flavour and freshness. Cool spring temperatures restrict yields, ideal for the concentration of flavours. Dry autumns allow for the fruit to develop optimum maturity. Although growing conditions across the two valleys are similar, there are enough differences for Vavasour to formulate a complex yet fully integrated wine. State of the art handling techniques and unique yeast strains are integral to the vinification process, capturing and enhancing the vibrant fruit flavours. A profoundly fresh Marlborough Sauvignon Blanc, vivaciously fruit derived, bottled completely unwooded and unoaked. A pale straw colour. Classic regional styling, on the nose it shows ripe passionfruit, guava and fragrant citrus notes, balanced by a great mineral acidity. A surprisingly full-bodied wine with very pure and pungent melon and green capsicum flavours, the palate offers ripe melon and lime with lingering gooseberry flavours. Redwood Pass is crisp and dry and will complement a wide variety of food, try with goat or feta cheese salad.